Autodesk has released the first Service Pack for the AutoCAD 2013 family. SP1 for AutoCAD 2013 (plain AutoCAD plus the Design Suites versions) and AutoCAD LT 2013 fixes a series of problems reported using the CER (Customer Error Reporting Utility). Besides that, SP1 introduces new protection mechanism against viruses and malware attacking AutoCAD users through the autoloading of AutoLISP and VBA code (typically acad.lsp). This mechanism includes several settings which allow to disable or specify autoloading. The new "/nolisp" runstring parameter for acad.exe can completely disable any execution of AutoLISP code. The LISPENABLED system variable then reflects the "nolisp" status. The AUTOLOADPATH variable specifies paths used to load the default customization files (acad.lsp, acad.fas, acad.vlx, acaddoc.lsp, acaddoc.fas, acaddoc.vlx, acad.dvb); its default value "" means loading similar to the older versions. A very interesting technology comes to CAD world with the new plugin for Autodesk Showcase 2013 released on Autodesk Labs - "Augmented Reality". Augmented reality is a live view of a physical, real-world environment whose elements are augmented by computer-generated input such as rendered 3D models (see Wikipedia - augmented reality). Autodesk Showcase with the added plugin "Augmented Reality" is able to insert (key-in) a photorealistic 3D model from CAD applications in real-time into live video from a web camera or other video sources. And it automatically zooms and rotates the model simultaneously with any change of the camera view. This Python script uses an easily identifiable marker which is associated with the 3D model and can be found also in the scene (a printed QR code is used in the sample below, and is also included in the installation). The software then identifies and monitors any movement of this marker. The result is a compelling interactive visualization which fits the proposed CAD model to the real scene and allows to explore this new "augmented reality" from any angle. 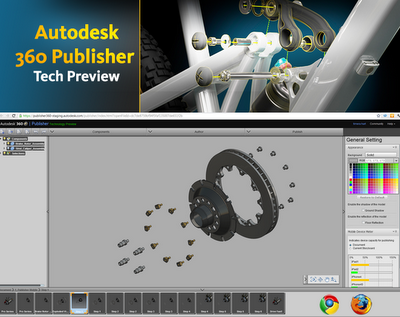 The 3D visualization tool Autodesk Showcase 2013 is a part of almost all Autodesk Design Suites so many users can use it immediately. The plugin "Augmented Reality for Autodesk Showcase" can be downloaded for free from labs.autodesk.com/utilities/showcase_ar, the current version expires October 31, 2012. 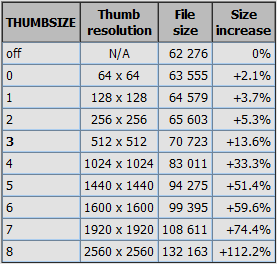 With the new format and resolution of preview thumbnails stored in the AutoCAD 2013 DWG files, we wanted to benchmark the influence of thumbnail settings to the overall size of DWG files. The thumbnail size is controlled by the THUMBSIZE variable - it specifies the pixel resolution of PNG previews stored inside the DWG files. DWG file size is also influenced by the incremental save mechanism so first of all we needed to set ISAVEPERCENT to 0. Our initial tests brought strange results - some DWG files were influenced by THUMBSIZE setting but some were not. With the help of Autodesk support (thanks!) we located the problem - the new, higher THUMBSIZE values are applied only on 3D drawings. The DWG file size is more than doubled with the highest THUMBSIZE setting but the influence in real-world drawings will be less dramatical. But in any case do not increase the THUMBSIZE setting if you have no good reason to store hi-res thumbnails (up to 2560x2560 pixels). During the conference SIGGRAPH 2012 on computer graphics, Autodesk has released the traditional annual "show reel" - presenting the best works of his customers using the "Media and Entertainment" products by Autodesk - first of all animations and videos from the area of TV ads, film special effects and computer games. Enjoy in higher resolution and in full-screen. There are many low-priced AutoCAD clones on the market - some have already vanished, some new are coming. All of them are trying the same thing - mimick as much as possible the AutoCAD functionality plus UI, and achieve compatibility with the genuine AutoCAD DWG file format to capture (at least temporarily) some AutoCAD users. One of the chinese AutoCAD clones was recently released in a new "plus" version with bombastic claims about "unprecedented" DWG compatibility and "50000 extremely rigorous drawing tests performed to guarantee seamless DWG processing". We have tried to verify these claims with our own (both rigorous and not so rigorous) tests - a set of standard AutoCAD drawings and with our DWG benchmark test - Budweiser.dwg (www.cadstudio.cz/budweiser). Started with the Budweiser2013 version – this cannot be opened at all (OK, it a is a rather new format). But surprisingly, even the 2010 version of this test cannot be opened at all there - reporting an "unknown DWG format" (any AutoCAD or AutoCAD LT will read it reliably). But why unknown? Version 2010 DWGs should be already "seamlessly compatible"! A converted version of this DWG test will finally open but then the Budweiser benchmark shows that all the following test cases fail: #7, #8, #11, #17, #18, #22, #25, #26, X (annoscale). So it makes rather a 70% compatibility, not the claimed 100% compatibility (if you can call anything below 100% a "compatibility"). None of the clones can also handle password protected and signed DWGs.